Hi Jotform team. 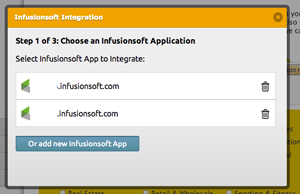 I have a number of forms integrated with Infusionsoft. Tonight for some reason all of them are not working. When I try to edit the integration parameters the system returns an error "Cannot find App". 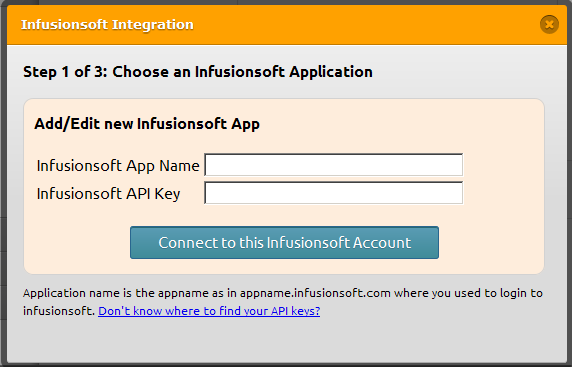 If I try to add a new Infusionsoft app the system returns and error stating "Cannot retrieve user details. Contact Admins.". Can you please look into this and let me know what is wrong? I'm demonstrating a large system to a client tomorrow that relies on this connection. This is super, super urgent!! What I would suggest is to clear your browser cache and I will be clearing your jotform cache. Do check if these two things help you. If not, do let us know. No, no luck. Even opening it on a completely different computer does the same thing. 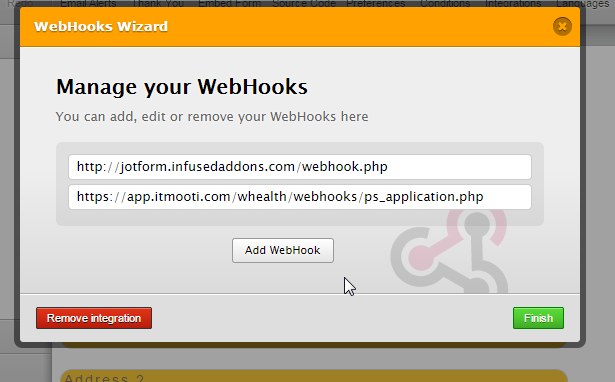 I cannot add edit an existing infusinosoft integration or add a new one at all. Please let me know what is required to get this sorted. 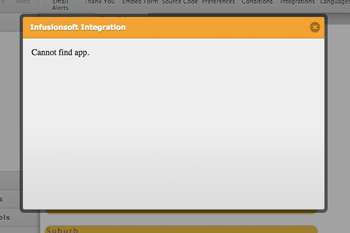 It also seems that I cannot delete an Infusionsoft application (I wanted to remove the application I am connecting to and re-add). I apologize for the inconveniences that this might have caused you. Upon checking your account, I see that the integration is now removed. I would also like to suggest that you use different web browsers, we usually recommend Chrome and Firefox. Another is that, if you are having problems with direct integration, you can use Zapier, a third party app that integrates different Apps with JotForm. I hope this helps. Let us know if this works. Any help would be mightily appreciated. I have tried chrome, firefox and Safari - on different computers - to no effect. I have also tried the zapier integration but it does not transfer checkbox fields correctly like your inbuilt integration tool does. Just to clarify, this is the account you are logged in itmooti? 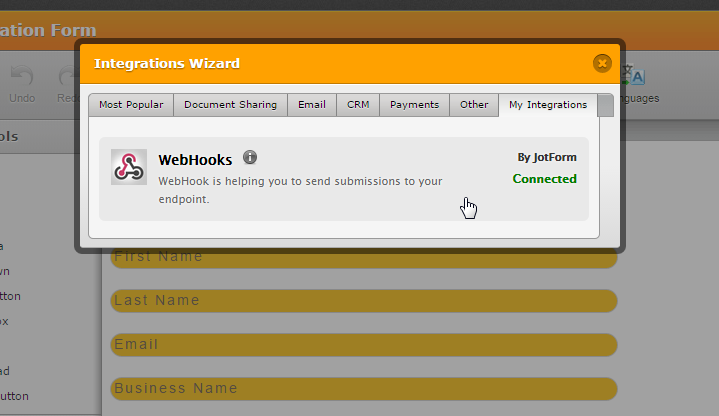 And this is the form you have integration with http://form.jotformpro.com/form/43112008880951? 1. I've checked your account, and I see this in your integration, the Infusionsoft seems to be not connected. 2. But I do see that you have an integration in WebHooks. 3. And is it something related to Infusionsoft? I'm not sure if I'm on the same form you have, but please do correct me if I'm looking at a different Form. I apologize again if you are having problems with the integration, we'll wait for your response and try to see where the problem might be. 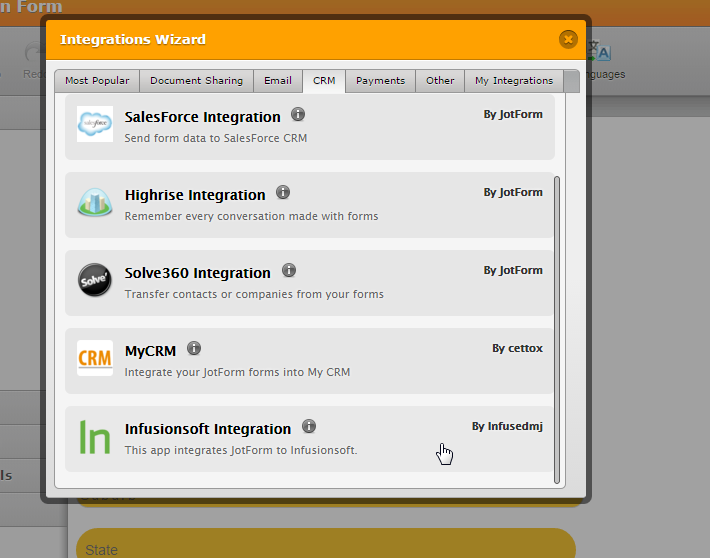 However, after leaving it for the day I have just tested it and the integration settings are once again available. I have no idea what happened over the last 24 hours but it seems to be working again. Thanks for your input and suggestions. I will let you know if it happens again. Great to hear that it is working for you now, but do let us know if this happens again. To avoid looking at the wrong places as you do have quite a lot of jotform, I would only ask if you could tell us the jotform that has the issue as well to catch it as it happens (if it happens) - hopefully it will not.